As you may know, YouTube can be a fickle beast! I started YouTube in July 2013 (Channel – MrHairyBrit) as an experiment to try to understand how YouTube worked and how it could help me in my day job as a web developer. I soon found out that YouTube was a very engaging, friendly social media platform that rapidly become my new hobby and passion. I started to make 3 videos a week, a mixture of movie reviews, video replies (when they still existed), rants and funny news – slowly gaining YouTube Subscribers. Each time I would look at my videos and slowly work to improve on my camera framing, audio quality, and practiced on talking to a camera – all while on a tiny budget. Roll forward to October 2016 – I had been on YouTube for 3.5 Years, made 600+ videos and kicked, punched, scratched my way to nearly 8000 YouTube Subscribers. Its a number I am proud of because during this time I had many successes and many failures, some great videos and some horrifically cringe worthy videos… but then I did something that helped my channel EXPLODED! I gained 10K YouTube Subscribers in just 7 months! Gaining 2000+ YouTube Subscribers a Month!! After months and months of making 3 videos a week, not seeing any major changes to my monthly views, I felt I needed to shake up a few things. I started thinking “if a website had 600+ pages of content surely some of those should get traffic? !” So with that in mind I started researching YouTube Video SEO and here are…. After 3.5 years I had over 600 videos but many of them failed in the Video SEO game. I looked back over my old videos and was horrified to see how badly I had tagged them. I updated them with new more accurate Video Titles, Descriptions, Video Tags and added a new EYE CATCHING thumbnail. Using TubeBuddy, I would update 5-10 videos a day and over time some (not all) would be reindexed by YouTube and spring back to life again! I personally find that 80%+ of my viewing audience now views me on Mobile devices, smartphones, iPad and other iDevices. This was something I had not optimised for when I started making videos in 2013. The old annotation system allowed you to add helpful links but mobile users couldn’t use them…. but they CAN use End Screens and Info Cards! Using TubeBuddy, I bulk added End Screens and Info Cards to all my videos helping to boost interaction with my mobile viewers, making it easier for them to watch more videos and subscribe to me! I noted that some of my videos would get regular traffic. I collected my to 10-20 videos and built playlists around them. Each playlist would have theme that matched the top video and I placed that video at the top of the playlist, making the playlist a SERIES. This mean YouTube can then associate those videos to each other and suggests them more as the next video in the related auto-play video section. This also meant that I could use the video that was getting traffic to feed the other videos in the playlist with traffic, increasing overall watch time and views! 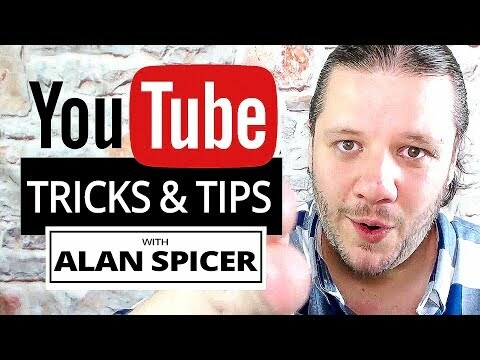 I am now starting my 2nd Channel (Alan Spicer – YouTube Tips and Tricks) to teach people How To Grow Your YouTube Channel. I hope this helps you to Grow Your YouTube Channel – If you have any questions please do get in touch and I will try and help you!